Added on November 6, 2013 by michael rees. Converge: Ghraib Bag is included in the Museum of Art & Design's Out of Hand: Materializing the Post Digital, curated by Ron Labacco. Viewers are encouraged to use their smart phones to see the animation for the exhibition. A local QR TAG takes them to the animation (click here) or by typing http://www.thwack.tv. These works will be up until September 1, 2014. Converge: Graib Bag is connected to Rees’s sculptures from 2003-2010 from the Putto Series. Located within the grotesque and the uncanny, Rees experimented and developed a method of working that used animations and industrial forms of manufacture to create large scale sculptures and media experiences that engaged political realities. The ideas grew out of art historical antecedents but were extended to address our new political reality, a nation at ware willing to stretch legalities and to engage in torture. Converge recalled Hans Bellmer sculptures, Calder’s large modernist plaza installations, and Nauman’s linguistic constructions but then also the photographs from the prison at Abu Graib. The body is a conglomeration of many bodies: the sense of multiple consciousnesses occupying the same corporeal body, or the valences of an object containing various layers of the political, the aesthetic, the historical and so on. As such they begged questions about our technologies, our desires, and our moralities. They put the viewer in the cockpit view of a train wreck of tendencies. They reflected a concern about war and our divided culture. 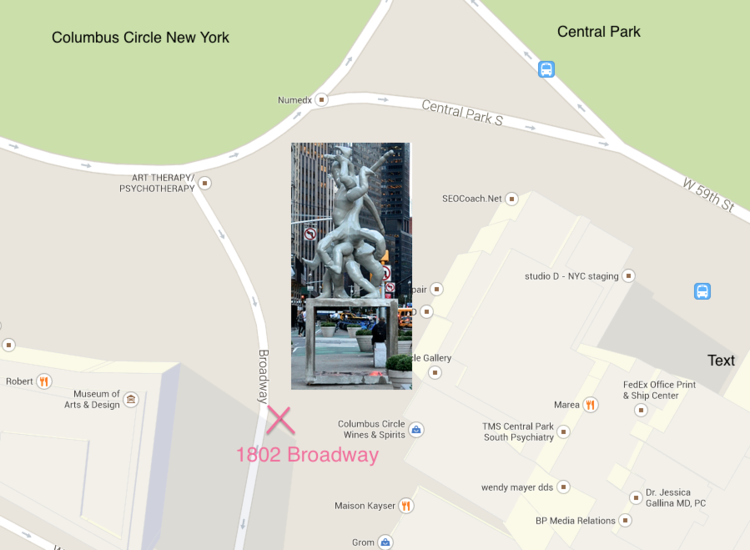 Converge: Ghraib Bag is a sculpture and animation sited on Broadway between 59th and 58th, New York City. 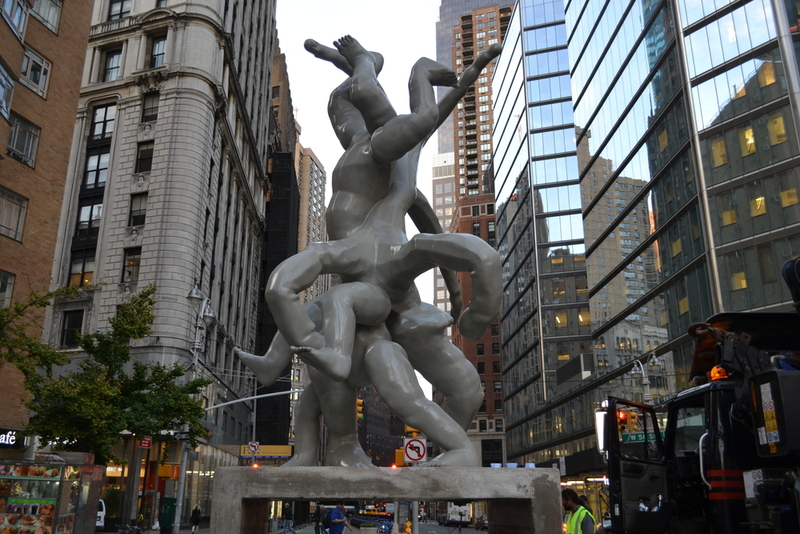 The 12' sculpture is a combination of two sculptures occupying the same space. It sits upon a base with a QR Code that links to an animation of the work in movement. The sculpture is generated from a frame from the animation. Upon viewing the sculpture and animation, and sorting out what the viewer is seeing in this melange of media and form, the sense of power and confusion emerges. The sculpture is presented in monumental fashion, not unlike the many paens throughout new york to powerful mayors, presidents, wars. Instead of identifiable figures and clear historical recapitulations, Converge takes torture and power at its center. At the same time, viewing the sculpture is not unlike the current political morass, it is difficult to discern what is real, which figure is in advance and which in retreat and so on. All of it is a "multi headed hydra", neither entity clear defined as a singular evil, neither entity clear defined. Converge is a sculpture that has grown out of early work of mine, starting with the Studio Performance Photographs from 1991, the Putto Sculptures from 1993-95, and the large scale Sculpture and Animations from 2003-3007. These tie a personal evolution in sculpture, performance, animation, and photography to larger political realities. On one level it may seem trivial to include these works in a project that engages torture or power. On the other hand viewing the photographs of Abu Graib have many distinct and strange experiences: our sense of horror, or sense of denial, an experience of the uncanny, the sexualizing of trauma and so on. My Studio Performance Photographs were not made during this time, but some 16 years prior. It was a different America then, optimistic, money driven, apolitical, and decidedly 12 step. People turned inward to explore themselves and prisons of their own making: alcoholism, drug abuse, memories of sexual abuse and so on. There were suicide bombers in the news but few and far between against the optimism and background of a rising, racing Silicon Valley. Psychology and theory permeated profound critical strategies and pop tomes about the inner child, overcoming your programming, and the self help bonanza. These photos were done in that time, part narcissism, part blind art, part personal revelation, part externalization of internal emotional states. The first Putto Series out of which the Sculpture and Animation pieces have grown, were executed just a pair of years after the photographs. In an aesthetic way they sought to grow out of minimalism, to break recursive formal content. In another way, one of their layers of meaning suggest a wetware hardware post-human terror. Their colors taken from the ubiquitous banal and overlaid onto the pieces as camouflage for those environments: minty green industrial paint, school bus yellow, army green, and so on. Photographs accompanied these pieces that emphasized camouflage. These sculptures engaged the pygmalion nature of reality and sculpture reinforcing this sense of the creative nature of perception. Finally, Converge is connected to works from 2003 - 2008. I experimented and developed a method of working that used animations and industrial forms of manufacture to create large scale sculptures and media experiences. They grew out of art historical antecedents from Hans Bellmer sculptures, Calder's large modernist plaza installations, and Nauman's linguistic constructions. There is the hint of the bio-morphism of Henry Moore's vital energies, perhaps gone awry, but still a dance of life. Even in Moore's time his hard won humanism was paralleled by Francis Bacon's perverse constructions. My works considered these tendencies and were mixed up with digital media and large cinematic influences along with real world science faction and the sense of a real and fictional grotesque. Each body is a multiple conglomeration of many bodies: early I talked about the sense of multiple consciousnesses occupying the same body. From the start, in vague ways, this series was concerned with war, a culture divided, my own confusion about what was happening, and the dogged insistence to maintain a fiction of art making. They were a protection too, a golem of sorts. And they begged questions about our technologies, our desires, and our moralities. They put the viewer in the cockpit view of a train wreck of tendencies. One is repulsed and drawn in equal measure. They are masculine, over powered, hydraulic and testosteroned up. Pornographic -- or not, violent --not really, harsh and soft, but surely ambiguous conflicted, conflated, cancelled. Babies grown up all wrong in an ambiguous sloth. And they are beautiful too. Sometimes I think of them not so very differently from Matisse's "Dance" for the post-human crew. The nod to Giambologna suggests other layers. In Susan Sonntag"s essay Regarding the Torture of Others she says: “Considered in this light, the photographs are us.” My Putto sculptures from 2003 to the present are made with this last sentence in mind. Whatever we do to them, we do to ourselves. As Naomi Wolf points out in “The End of America”, after illegal prisons and state condoned torture, the next step of a slide to facism is to create a category for detainees that is beyond the law. Its a category that renders them inaccessible, unavailable, untouchable, ambiguous. In this country we created a category called “enemy combatants”. The President can define anyone as “enemy combatants” and deny them the rule of law which is the bulwark of our constitution. By denying them due process to the law, we set up the possibility that we will deny ourselves that process, in a linguistic turn, a detailed but significant shift. The imagery for Converge starts in Abu Ghraib. What we have done to them we will do to ourselves. I hope to mirror the cultural shift that we have all witnessed.